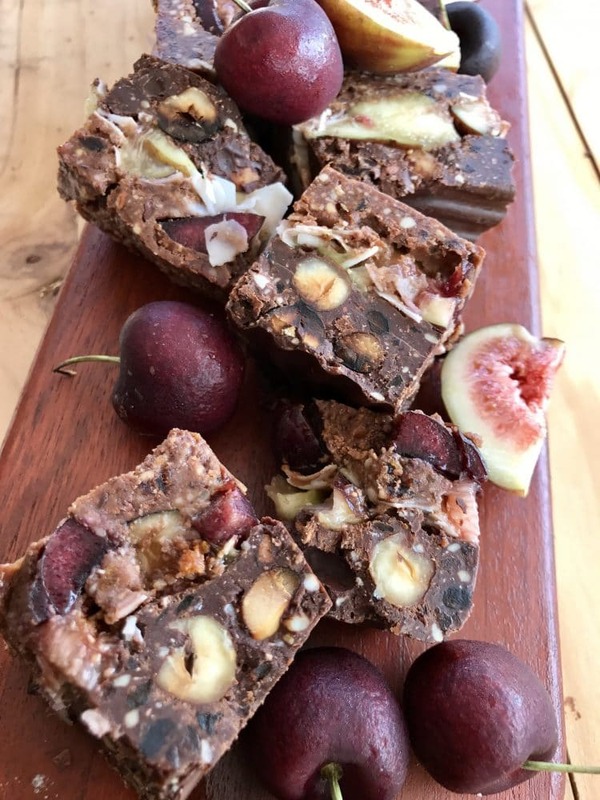 A decadent blend of dark choccy, cherries, toasted hazelnuts, coconut & fresh figs! But you could use strawberries, raspberries, blueberries, apricots…& any nuts / seeds to go with! Be inspired by what you find at your local farmers markets. 1 small Vegan or Whey ballBag (plus 45g of coconut oil). 1 or 2 small blocks of quality, 70-80% dark chocolate (approx 150 – 200g, I used Lindt). 1/2 cup (or to your preference) of coconut flakes (also toasted if preferred). 1) Melt the dark chocolate in a double saucepan & put the nuts & coconut in the oven to toast (seperate trays in case they cook unevenly). Spread them out, & keep checking & tossing every 2 minutes or so. 2) Mix the coconut oil thoroughly into the ballBag mix with your hands while the chocolate is melting. 3) Combine the melted dark choccy & BallBag – coconut oil mix well, & press a 1cm thick layer into a silicone loaf tin (or baking paper-lined metal tin). 4) Gently press the hazelnuts, & pieces of fig & cherry into the soft choccy mixture, being careful not to squish them too much! 5) Layer some coconut flakes over the top. 6) Cover with another layer of the choccy / ballBag mix, gently moulding & pressing together until not too many gaps are left. 7) Refrigerate until set, then slice into squares carefully. Thank you to Jeanie for this recipe!